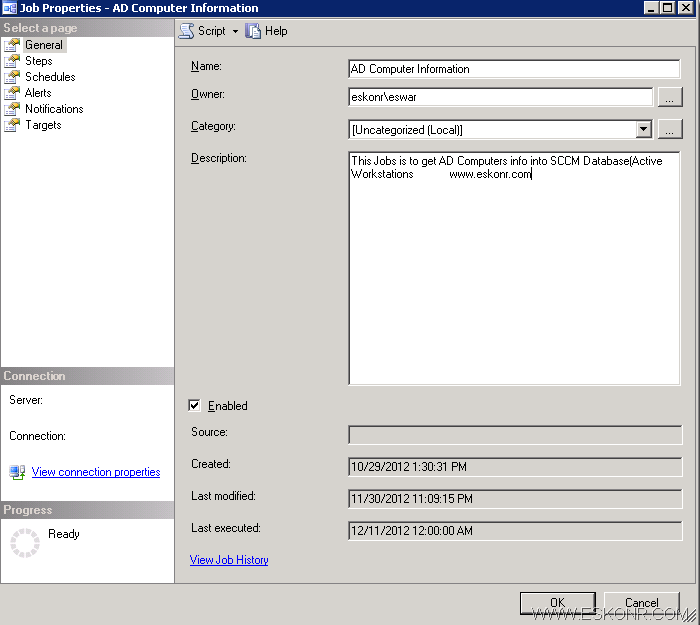 You are here: Home 2012 December How to get AD computer info into SCCM Configmgr 2007/2012 Database ? How to get AD computer info into SCCM Configmgr 2007/2012 Database ? 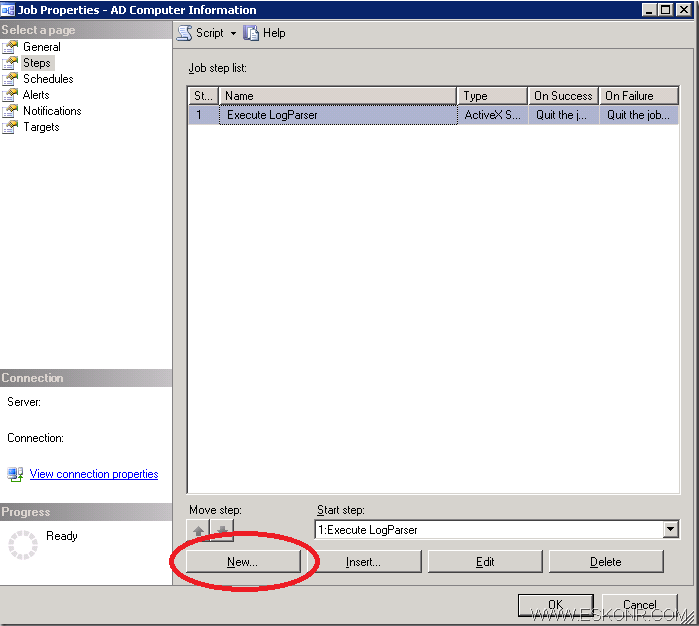 Getting Active Directory information into SCCM Database can be done by configuring Active Directory discovery Methods in SCCM Configmgr but there are cases, wherein some of the computers may not be discovered or Computers do not exist in AD but do available in SCCM Database. I used MaikKoster Old blog post as reference and made some customization's/Updates to the query to retrieve information about only Active Computers (Exclude disabled Machines). Comparing AD Computer information with SCCM Database sometimes interesting to know about client health and are there any missing clients that did not discovered by SCCM into Database. 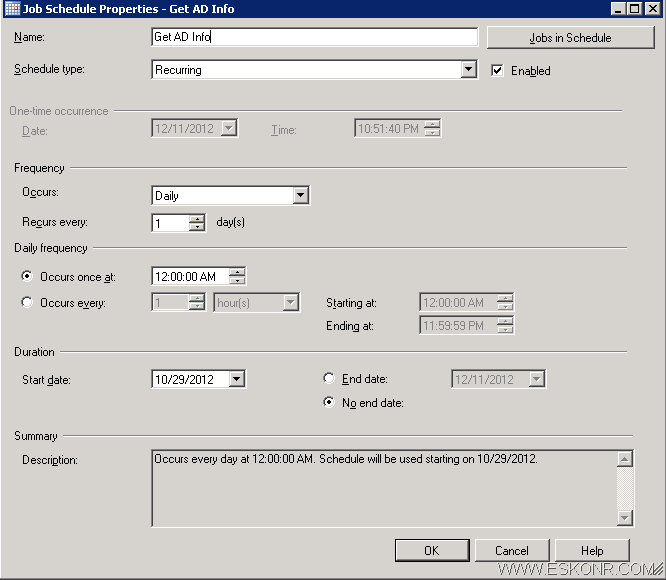 This also helps you to focus more on clients inventory issues .There are cases ,wherein User will be logged into domain(using last logon timestamp) but client will not report to site .With this you can create hardware inventory report for computers not reported with in X number of Days with AD last logon Timestamp. (if your discovery is not customized and run frequently). You can use this procedure in SMS 2003, SCCM 2007 and SCCM 2012 environments. Updated : Please be clear what information ,you want to retrieve from AD into SCCM Database in the initial phase else you may lead to an issue to update the existing table with custom attribute values. I tried adding more attributes from AD to the existing SQL Job what is already been created but i failed . I have to drop the table ,Change the query and run the job to make it Work. On the General Tab,Enter the required Fields as per appropriate. 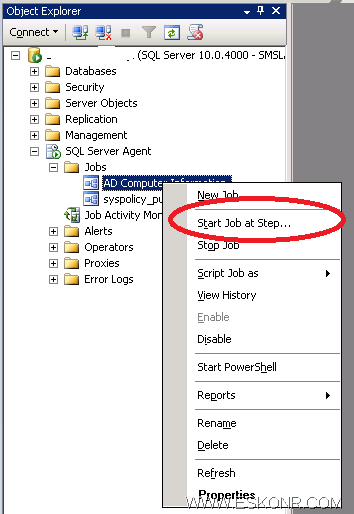 Move to Next tab Steps .This is the step where you Create Job to execute and get AD computer Information into SCCM Database. You are prompted to select Different fields like Step Name (AD info), Type(ActiveX Script) and Run as(SQL server Agent Service Account). Next is to import the the script to execute. Download the Script from Maikkoster website here and Import it using Open. strQuery = "SELECT cn, objectpath, operatingSystem, operatingSystemServicePack"
strQuery = strQuery & ", CASE LastLogonTimestamp WHEN 0 THEN NULL ELSE "
strQuery = strQuery & " TO_TIMESTAMP(ADD(DIV(TO_REAL(LastLogon), 10000000.0), TO_REAL(TIMESTAMP('1601','yyyy')))) END AS [LastLogon]"
strQuery = strQuery & ", CASE pwdLastSet WHEN 0 THEN NULL ELSE "
strQuery = strQuery & " TO_TIMESTAMP(ADD(DIV(TO_REAL(pwdLastSet), 10000000.0), TO_REAL(TIMESTAMP('1601','yyyy')))) END AS [PwdLastSet]"
strQuery = strQuery & " INTO " & strTable & " FROM"
strQuery = strQuery & "'" & strLDAP & "'" & " where "
StrQuery = strQuery & "userAccountControl" & "=" & "4096"
Note : You can do customizations to the above query depends on your requirement. I have uploaded the modified script here. 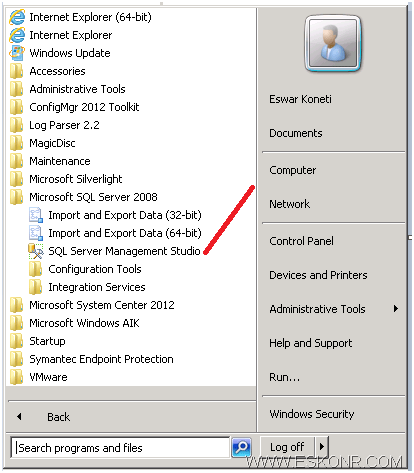 You just need to replace the domain ,SCCM SQL server info ,SQL table and LAP path. Schedule it as per the requirement. Start the job which we created now. You see from below,Job is executed successfully. Now its time to create Various reports based on your needs. Simple report to list Computers which are not available in SCCM but do Exist in AD as Active. Replace the Database name and table what you given in VB Script earlier. 33 Responses to "How to get AD computer info into SCCM Configmgr 2007/2012 Database ?" I have changed the quotes to the original and below are the 2 lines whi I see at line 35 and 36. While trying to start the job Iam getting the below error can you please let me know where Iam going wrong. Error Code: 0 Error Source= Microsoft VBScript runtime error Error Description: ActiveX component can't create object: 'MSUtil.LogQuery' Error on Line 35. The step failed. Can you check the script at line 35, there will be something mistake... What is it from line 35? Have you changed the quotes to original? 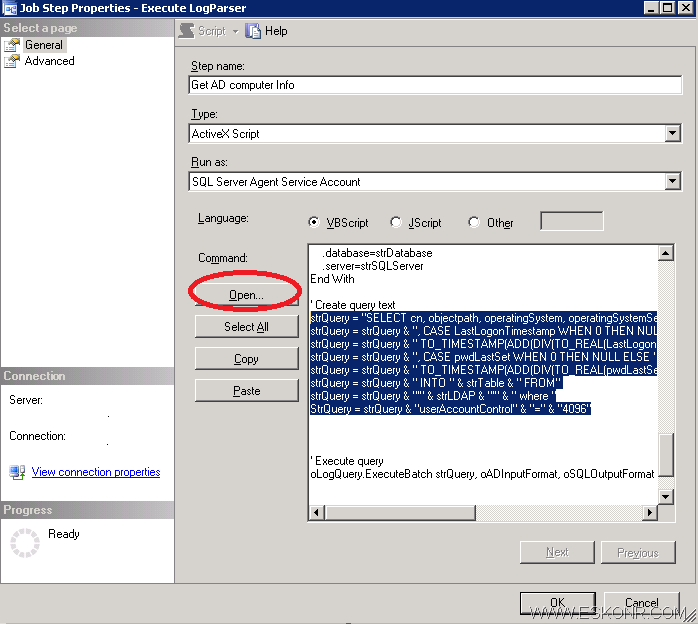 Yeah thats what I have done but it still says "Executed as user: DOMAIN\SQLserviceaccount. The step did not generate any output. The step succeeded"
not generated any output ? are you referring to the table created for AD info which is blank ? or newly created table has info but you are failed to retrive it ? if the task is executed successfully but no results,then i would suspect something wrong with the LDAP you have provided . Sorry to bother you again but I just wanted to ask one more thing. 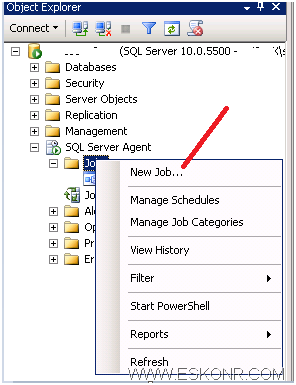 When the SQL Job is run, it should import AD data into the SQL database. I was just looking at the log of that job and got the below. Executed as user: DOMAIN\SQLserviceaccount. The step did not generate any output. The step succeeded. I am wondering if it is working correctly as it says "The step did not generate any output". I also am pointing this section to a OU as I don't want to import all of AD, I assume that that is OK? Yes the SQL runs on another server but I logged into that server with my admin account and created. I then logged into my SCCM server with same account and tried to run the report. If it is a permission issue I will just have to keep at it but I can't see how it could be.. I guess it might have something to do with my SQL being on another server.. Sorry took so long to get back to you but I had to track down the account details. I have since tested with the Service account and have the same issue. Are you using the same account which was used to run the SQL job ?If the account which was used to run the job has enough rights to create the View,then should have the account with full permissions. I am sure this is something to do with security permissions.Use the account which was created SQL job to get the AD info into Configmgr DB. Still get same error even after adding. Can you try with admin account or service account which has been used to create/install sql server to check if it is really permissions issue or something else? In fact shouldn't SCCM be connecting with its own account to run reports? Nope. It takes user permissions what is allowed for the user to run and display results. My admin id already has read\write to my database (I can open and run query's in SSMS) but I added it anyway and still have same issue. If this is just a table in my main SCCM database why is it not just connecting with the same details as all the other reports? Is it due to the way I created it? Have you tried adding the permissions as i said in the blog post? Did it work after? I can see the table in SQL but when I run that report I get this error. Do you know what it means? 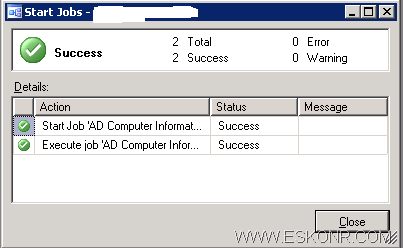 The SELECT permission was denied on the object 'ADComputersInfo', database 'APAC_SCCM2007', schema 'dbo'. It is related to permissions issues.Did you try this ? http://eskonr.com/2013/09/sccm-configmgr-sql-errorthe-select-permission-was-denied-on-the-object-database-cm_sitecode-schema-dbo/ . Error Code: 0 Error Source= Microsoft VBScript compilation error Error Description: Expected end of statement Error on Line 85. The step failed. strQuery = strQuery & " TO_TIMESTAMP(ADD(DIV(TO_REAL(LastLogon), 10000000.0), TO_REAL(TIMESTAMP(’1601′,’yyyy’)))) END AS [LastLogon]"
strQuery = strQuery & " TO_TIMESTAMP(ADD(DIV(TO_REAL(pwdLastSet), 10000000.0), TO_REAL(TIMESTAMP(’1601′,’yyyy’)))) END AS [PwdLastSet]"
strQuery = strQuery & "'"& strLDAP & "'"& "'" where "
did u replace all the ' and " quotes after you copy the script ? can u look for the line 85 ? what does it tells ? any syntax missing ? I have tried the steps exactly mentioned in the blog but Iam getting the below error. Error Code: 0 Error Source= Microsoft VBScript compilation error Error Description: Invalid character Error on Line 55. The step failed. seems you are missing something from the script.can u or post me the script not completely but the error code line. Error code:0 Error Source=Microsoft VBScript runtime error Error Description: ActiveX component can't create object: "M S Util.logQuery" Error on Line 59. The step failed. Did you imported the query from Maikkoster Blog ? and just only edit the content what is the blog post. Also please replace the quoates(' and " ) .existing are fancy quoates so they do not work. However, I search (because i don't know to do it) a script to enumerate from a computer list the value on attribute "description". Yes ,that is expected. Please refer the blog post with updated information.That should clear your mind. is it running on SMS 2003 ? Yes it will work but if you are running SQL sever 2005 and more,should not be an issue.You should get it as same as SCCM 2007/2012.